As we bid adieu to 2012, we wanted to wrap up the year with a final post on a new feature we added this year -- our business tracker. In terms of raw numbers it was a good year. 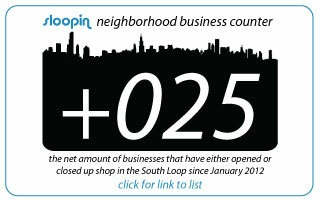 By our records, there were a net 25 businesses that opened in the neighborhood. Pretty impressive if you ask us. One big knock on the neighborhood historically was that we don't have a ton of eating, drinking and "entertainment" options. While we don't really buy that, 2012 saw some solid additions. We will be continuing to track businesses opening and closing in 2013, so please let us know if you hear or see anything in the new year. American dog closed and something new opened in there spot, I think it is called Urban Corner. Gino's East (Sports Bar) replaced Edwardo's which closed this year and isn't on the list. Good place and sad to see it go. What about the closed shoe store on Halsted by the viaduct. I think it was called "Shoe of Sole". I agree - you can't include Gino's without counting Edwardo's. Improve the list Sloopy! Fair enough. We've added Edwardo's to the closed list. There's a hair salon and a clothing store that opened at the 2025 S Indiana building that are missing from the list. Not sure what the names are. You also missed the 2 South Loop Market branches that opened... the one on Van Buren and the one on Prarie. These are the same guys filling the Alain's space with the Mediterranean tapas restaurant. You need to give them props, as they've opened more businesses in the Sloop then anyone the last few years. In regard to "Shoe of Sole", we're not sure about that but also don't consider Halsted to be in the Sloop. That's more university village. In regard to South Loop Market on Van Buren, we consider anything north of Congress out of the Sloop. Adios Chicago Journal -- You Will Be Missed! Dearborn Bike Lane Opens Today! Having a Great Night in the Sloop? Wabash Dog Park featuring Fred Anderson? Shots Around the Sloop: Fog-pocalypse!